A Swiss archaeological has been instrumental in unraveling the century-long mystery of the Temple of Artemis on the Greek island of Euboea. While historians have struggled for around ten decades to locate this elusive yet famous ancient open-air sanctuary dedicated to the Greek goddess of the hunt, the researchers recently identified the actual site about 6 miles away from where it was originally thought to be. To that end, the incredible archaeological site was discovered at the foot of the Paleoekklisies hill, in proximity to the small fishing town of Amarynthos. This archaeological project in question was started way back in 2007, led by Karl Reber, a professor at the Universty of Lausanne and director of the Swiss School of Archaeology in Athens. Their first major discovery entailed the remnants of a massive wall that was dated from the Classical Era, which was possibly a part of the stoa (covered walkway) near the main sanctuary of Artemis. And then in 2012, the team had further success in uncovering a few segments of an ancient complex, after digging exploratory trenches in Amarynthos. 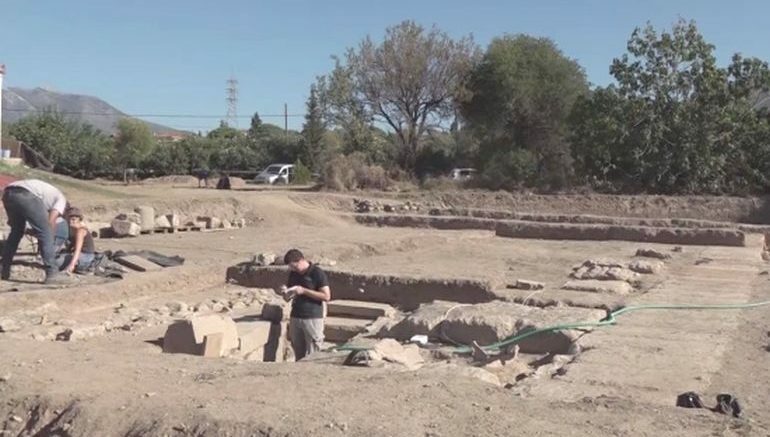 And now in 2017, the Swiss researchers have finally established the authenticity of the long-lost site encompassing the Temple of Artemis in Euboea, after discovering artifacts with definitive inscriptions. According to their gathered evidence, this area was the focal end point of the annual ritual procession that people took all the way from the major Euboea city of Eritrea. In that regard, Artemis was worshipped as the patron deity of Amarynthos, a town that derives its name from a mythical male character who was infatuated by the goddess. As for the historical side of affairs, Eretria, boasting its preeminent position as the leading city-state in the second largest Greek island of Euboea, heeded the call (along with Athens) of the Ionian rebels against the rule of the Persians in 499 BC. But unfortunately, for the maritime power, the Persians under Datis took their revenge by sacking and burning the city in 490 BC. This resulting sequence of events set the stage for the momentous Battle of Marathon. And like a proverbial phoenix, Eretria did rise from its ashes to also contribute to the famous Battle of Plataea (circa 479 BC), by sending around 600 hoplites against the Persians of Xerxes.